Thank you for visiting MAOFAED Jewelry. We are specializing in jewelry making. If you like this product, we advise you add it to wish list now, so that we will inform you immediately once it has a discount. And you can click our brand name which on the top of the title; you can find more jewelry with high quality and reasonable price. we will do our best to solve it and provide you with good service , give you a perfect shopping experience on Amazon. Parent Wedding Gift - Father of the Groom Gift: "Thank you for being an amazing dad and teaching me all the most important things i know. I love you." - Mother of the Groom Gift: "Thank you for being an amazing mom and for your unending support, guidance, patience, infinite love. I love you." Material: Stainless Steel, it is lead free and nickel free, hypo allergenic, it doesn't rust, change colour or tarnish. Measurement: 50mm(1.97inch)*12mm(0.47inch). TIPS:manual measuring permissible error. 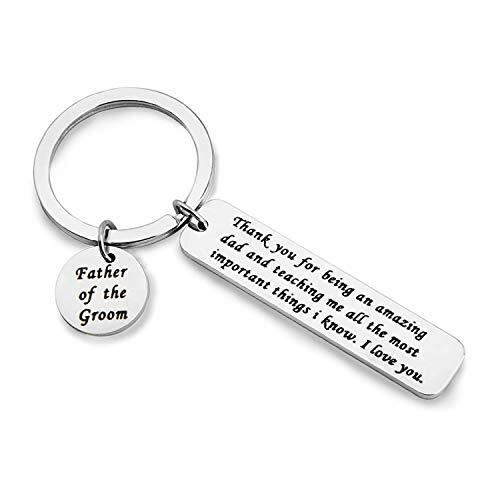 Give the father of the groom/mother of the groom a keepsake that he/she will actually use and cherish, it will bring tears of joy to his/her eyes when he/she reads your secret message on the keychain on your wedding day. Velvet bag- Only the most elegant velvet jewelry pouches are used to package and ship our bangle. If you have any quality problems, please feel free to contact us and we will give you a proper solution until you satisfied. If you have any questions about this product by MAOFAED, contact us by completing and submitting the form below. If you are looking for a specif part number, please include it with your message. FIBO STEEL 6mm Thick Curb Chain Necklace for Men Stainless Steel Biker Punk Style, 20"